What an adorable pair they are. I'm always amazed at the way you bring your characters to life with a colored pencil.Just wonderful. Soft and beautifully done! I love the textures, too! Aww, this breaks my heart. My girls do things like this all the time. They have such grand visions for inventions, but they're all seriously flawed. Oh, the disappointment after all that effort - sometimes it makes me want to cry. Very beautiful illo. I love the soft quality and the lovely colors. I love the softness of your work. I always look forward to seeing your take on the topic. Beautifully drawn, especially the girl's face and such pretty colours. I love it! Wonderful illustration! Beautiful colors and lovely textures! Absolutely gorgeous! I love the colours - the muted tones with the vibrant balloons are wonderful. What a wonderful and delicate image. Your illustration is beautiful. I really like the style, the texture, softness and the emotion portrayed by the entire piece... really wonderful. thankyou so much for all of your kind comments, they are much appreciated..
you really know how to work that colored pencil! This is great. Sad yet funny at the same time. Oh my! This is exquisitely cute! 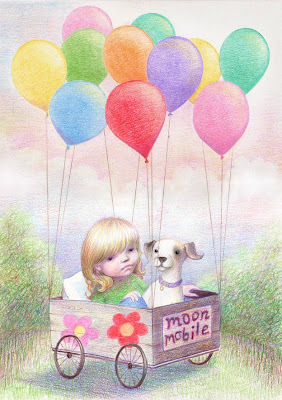 Everything about the image is wonderful, the characters, the soft colors, your expert use of color pencil... and the story it tells is heartbreakingly sweet! Love it! What a great concept! I had a similar idea at first, but ended up going with kites! Thanks for the comment! I love drawing balloons. This is a charming, gentle scene, Im sure a few more would do it!